We have developed a range of user interfaces for applications & intranets where we have taken SharePoint 2013, designed and branded it up to make it look beautiful and work equally as great. The Ambassador Theatre Group (ATG) is a major international theatre organisation headquartered in the United Kingdom. 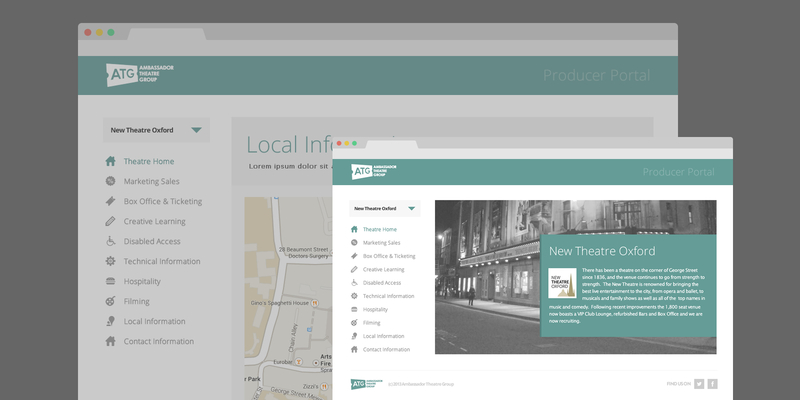 ATG's key operations comprise of theatre ownership & management, theatre producing activity and ticketing & marketing operations. As always we held both face to face & online requirement workshops, where we sat down with the client to discuss ideas, quick wins and how we could harness the technology out there currently as well as the out of the box SharePoint features. Creating the concept lets us quickly show the client the starting point from a design angle. We heavily reduced development time by focusing on the overall design and then individual parts of the design. Going forward we created all the design files as well as a wide range of icons. On the Producer Portal we not only developed a great looking, flat UI SharePoint 2013 design for the desktop we create a solution that was responsive and adapted design wise to both tablet & phone devices without affecting the user experience. 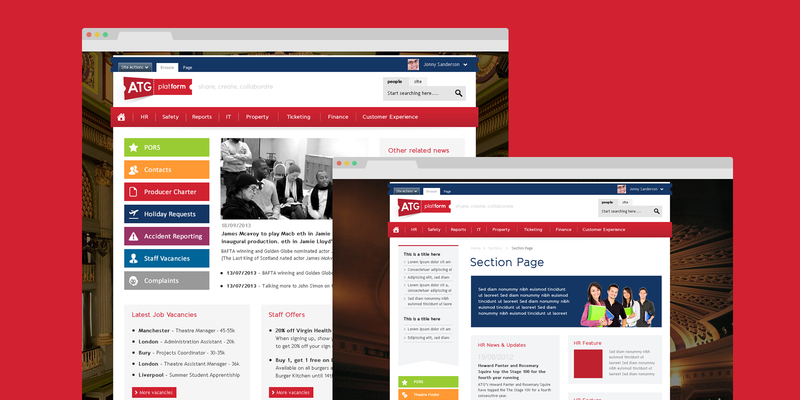 We full designed & branded SharePoint 2013 intranet for ATG. We developed a range of master pages and a selection of page layouts to display different content types. This was overlaid with a CSS that added the eventual colour palette & design to the intranet. Intranet usage has increased massively, users are heavily using the intranet for document sharing, collaboration & locating information. We continue to support ATG via Alphasoft with all SharePoint projects that require design & branding expertise. This relationship continues to be strong & its a pleasure when all three parties work together, long may it continue. "It was a pleasure working with PinkPetrol on the many ATG projects, there vision & knowledge was fantastic. The suggestions they made was clearly made by drawing on experience."